The most common causes of the tooth lost are caries and periodontal disease, following a tooth fracture (Jacobsen, 2008). Data suggests that in most industrialized countries 60-90 % of school aged children and almost 100% of adult population are affected by tooth decay (Petersen et al., 2005), with the prevalence, which is more higher in female than male (Lukacs & Largaespada, 2006; Ferraro & Vieira, 2010). Tooth decay or dental caries is defined as chronic, multifactoral disease characterised by localized destruction of hard tooth tissues. It attacks on the mineralized tissues resulting in demineralization and in some cases destruction of the matrix (Jacobsen, 2008) . By some authors dental caries starts as small subclinical demineralised subsurface, which following a periods of remineralization and demineralization, may progress or arrest (Walmsley et al., 2002). There is an opinion that approximatelly 50 different factors subdivided into a three groups are in correlation with caries etiology: The first group is formed of those factors associated with the host such as quality of saliva and bacterial flora (Streptococcus mutans, Streptococcus sanquis, Actinomyces and Lactobacillae are the most commonly isolated from the caries lesions. These microorganisms produce lactic acid, also known as the milk acid, responsible for the caries development). The second group includes outside factors such as diet and the substrate on which bacteria act, while the third group content a tooth itself and those features which either predispose to or resist carious attack (Jacobsen, 2008). Caries can affect enamel, dentin and cement, with usually localization at the cemento-enamel junction or in the cementum. However, in modern men grooves and fissure areas of the posterior teeth are the most common sites of decay (Newbrun,1989; Fejerskov & Kidd, 2008). There is a relationship between debth of the fissures and caries susceptibility, due to fact that food debris and microorganisms impact in the fissures. This leads to conclusion that a tooth morphology is an important determinant for the caries development. Due to gingival recesions and loss of periodontal and bone support, the root of the tooth may be exposed to the mouth and caries may occur (Jacobsen, 2008). During tooth eruption into the oral cavity, organic pellicle and cellular covering which protect an enamel surface, are disepearing and on this way open the gate to attach of the saliva and microorganisms to the enamel (Jacobsen, 2008). In cases of impacted teeth, partially exposed impactions are the most prone to develop caries. Partially erupted tooth does not participate in mastication and for this reason offer more favorable conditions for bacterial accumulation than fully erupted tooth. (Fejerskov & Kidd, 2008) Due to fact that lower and upper third molars are the most common enclosed teeth, pericoronitis associated with bad oral hygiene and lesser self clening area, leads to food and microorganisam accumulation that can not be cleaned through normal brushings and flossing, causing a caries development. The crowns of mesio-angulary and horizontaly impacted third molars often interfares with registering pocket debth ( Lenug et al., 2005) . Gingival swelling and inflammation may lead to the impression that the lesion is hiden in the pocket ( Fejerskov & Kidd, 2008; Jacobsen, 2008). It is interesting that even under the gums and situations in which no obvious communication between the mouth and impacted tooth exist, tooth decay might be developed. In cases of partially impacted teeth occlusal and approximal sides are the most commonly affected. 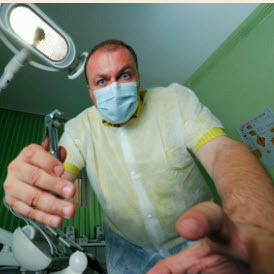 In extremly cases, a tooth crown might be completelly destroyed by the lesion. For mesio-angular and horizontal impacted lower third molars partially exposed in the oral cavity, occlusal surfaces form plaque accumulative crevices against the distal surfaces of the second molars (Chu et al., 2003). On this way they cause a distal cervical caries on the second molars, though estimates of the rate vary from 1% to 4.5%, which is difficult to be restored without extractions of the impacted teeth. Also, as the gingival margin recedes enamel-cementum junction becomes exposed forming forming a bacterial retention side and on this way forming root surface caries (Jacobsen, 2008). McArdle & Rentol. (2006) suggests that second molar caries indication is responsible for 5% of mandibular third molar teeth removals. However, data from different authors suggests that these numbers are higher. Thus, van der Linden et al. (1995) reported caries in 7.1% of impacted third molars and in 42.7% of adjacent molars (204 and 1227 of 2872 teeth respectively). In study of Adeyemo et al. (2008) caries and its sequela (63,2%) was the major reason for the third molars extraction, followed by reccurent pericoronitis (26,3%) and periodontitis (9,2%). However in the study of Obiechina et al. (2001), pericoronitis and periodontal disease (42,92%) were the major reasons for the third molar removals. The incidence of the caries was 13,95%, and it was on the third place of the third molar teeth removal indications (Obiechina et al.,2001). Lysell & Rohlin (1998) showed that caries was associated with impacted third molars and second molars in 13% and 5% of cases respectively, Sasano et al. (2003) noted that 14.5% of symptomatic impactions were associated with dental caries. The results of Bataineh et al. (2002) showed an overall caries rate of 23% in impacted molars and 0.5% in the second molars associated with impacted molars. Knutsson et al. (1996) reported a high caries frequency of 31% with impactions, which was more common in patients between 20 and 29 years, followed by the 30 to 39 year group. Gisakis et al. (2011) reported an incidence of caries of the impacted and / or adjacent teeth of 9,9%. Allen et al. (2009) reported an incidence of 42% of the distal second molar caries associated with partially or completelly impacted third molars. By the same study distal angulation and the other types of inclinations were not associated with detectable caries (Allen et al.,2009) Chu et al. (2003) reported a caries rates in 2-3% of lower wisdom teeth , followed by 7,3% of the adjacent second molars. Because of the mentioned, some authors suggested that the early or prophylactic removal of a partially erupted mesioangular wisdom teeth could prevent distal cervical caries forming in the mandibular second molars (McArdle & Renton, 2006). Caries lesions of partially impacted or adjacent teeth may or may not be cavitated, which is very important due to the fact that in cavitated lesions biofilms are more difficult to be controled by oral hygiene procedures. Cavitated lesions are the result of „undisturbed" dental plaque. In some cases tooth decay in the form of so called „hiden caries" might be present. This caries is characterized by lesion in demineralized dentin which is missed on a visual examination, but is detected radiographically ( Newbrun, 1989). Radiographically, the caries lesion is in form of radiolucent zone, due to the fact that demineralized hard teeth tissues such as enamel and dentin do not absorbe a X-rays (Newbrun, 1989). Some dental practitioners in the cases of the asymptomatic partially impacted lower third molars in the vertical positions with caries lesion development, performe conservative therapy as repair of the cavity with placeing a filling. However, for this approach, to avoid a risk for development of the recurrent caries, an appropriate indication is necessary. This means that the patient's good oral hygiene without presence of dental plaque must be present. In extreme cases, the tooth decay might be developed with great extension on the partially impacted third molars and adjacent second molars, that could not repeared with final result of the both teeth extractions (Walmsley et al., 2002). Comparing with lower third molars, upper wisdom teeth are not often seen as the causer of the adjacent teeth distal caries. Excluding a third molars, other impacted teeth may be also associated with caries risk. However, these findings are not so often seen. Impacted upper canine is mostly in correlation with a rooth resorptions of the neighboring teeth, caries lesions of second incisor and the first premolar are not often seen in cases of the partially impacted canines. A position and inclination of supernumerary teeth, a product of hiperactivity of the dental lamina, also have an influence on the caries lesion developments. Meziodens as the clinically the most common supernumerary tooth, responsible for diastema of the central incisors, depending of localization, may cause a palatinal cervical and mesial caries lesions of the central incisors. Distomolar a supernumerary tooth located distal of the third molar, although it is rarely seen, might cause a distal caries of the neighbouring tooth.